Despite the 30-percent tariffs the Trump administration slapped on solar panels in early 2018, the US added more solar power than any other type of electricity in the first quarter of the year. According to a report from the Solar Energy Industries Association, the US solar market’s capacity increased 13 percent year-on-year in Q1, accounting for 55 percent of all US electricity added during the period — that includes fossil fuels and other forms of renewable energy. The news shouldn’t be surprising for those watching the space. Indeed, Advanced Energy Now projects that the solar rooftop market will reach US$4.14 billion by 2022, growing at a compound annual growth rate of 9.7 percent until then. To help investors learn how to take advantage of the growing solar power market, the Investing News Network has put together a list of nine potentially up-and-coming US solar energy stocks. All trade on American stock exchanges and had market caps below US$500 million at the time of publication. Companies are listed in alphabetical order. If we missed a US solar energy stock that you think should be included, please let us know in the comments. 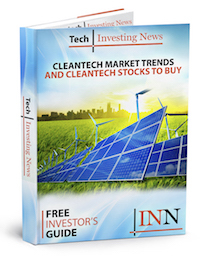 First on this US solar energy stocks list is Amtech Systems. It’s been over three decades since Amtech Systems was incorporated, first as Quartz Engineering and Materials. The company went public in 1983, and has grown into a global supplier of solar and semiconductor production and automation systems. BTU International, a supplier of thermal processing equipment solutions. Daqo New Energy is a manufacturer of high-purity polysilicon for the global solar photovoltaic (PV) industry. It sells its products to solar cell and solar module manufacturers. Headquartered in China, the company was founded in 2008 and has subsidiaries such as: Daqo New Energy Holdings, Daqo New Material, Xinjian Daqo New Energy and Chongqing Daq New Energy. The next company on this US solar energy stocks list is Ellomay Capital. The company is based in Israel, but its shares trade on the NYSEAMERICAN. For nearly a decade, its focus has been on the energy and infrastructure sectors. The company’s primary assets include roughly 12 PV plants in Italy, four PV plants in Spain, a 9.4-percent indirect holding in Dorad, and a 75-percent interest in a project to build a 340-MW pumped storage hydropower plant in Israel. ReneSola is another company with headquarters in China, although it trades on the NYSE. ReneSola began trading on the NYSE in 2008, but was founded a few years earlier in 2005. The company has offices and warehouses in over 16 countries and provides energy-efficient products. More specifically, RenSola’s products can be broken down into energy storage systems, inverters, wires and cables, solar racking systems and solar panels. With headquarters in Colorado, Real Goods Solar was founded in 1978 and is a residential solar power integrator company. Over 35 years ago, the company allegedly sold some of the first solar panels out of a general store in Northern California, and has since installed more than 25,000 solar energy systems in homes, businesses, schools, government facilities and utilities across the US. Its solar panel installation services are available in California, Colorado, Connecticut, Massachusetts, New Hampshire, New Jersey, New York, Rhode Island and Vermont. Sky Solar Holdings is based in Hong Kong and has been trading on the NASDAQ since November 2014. The company’s primary focus is on the downstream solar market, and it mostly develops projects in Asia, South America and North America. Since the beginning of 2015, the company’s operating income has primarily come from solar power generation revenue, and it has developed more than 198 solar power plant projects around the world. Spi Energy is also headquartered in Hong Kong and provides PV solutions for business, residential, government and utility customers. Its primary focus is on the downstream PV market, including the development, financing, installation, operation and sale of utility-scale and residential solar power projects. These projects can largely be found in China, Japan, Europe and North America. Its portfolio features projects in varying stages of development, from operation to construction. Next on this US solar energy stocks list is Sunworks, founded in 2002 and headquartered in California. Sunworks provides solar power systems for the residential, commercial and agricultural markets in California as well as Nevada. It has roughly 64 projects divided between the two states and has installed more than 850 systems. The company designs, integrates, installs and manages systems that range in size from 2 kilowatts for residential loads to multi-megawatt systems for larger commercial projects. VivoPower also provides financing, consulting, engineering and project management services for other developers. It holds a number of subsidiaries.